Don't you have certain pieces in your closet that are your no fail, go tos? They are the pieces that when you wear them you always look and feel your best. For me, this black cape, and this white tank are those pieces. I have mixed and matched this Forever 21 black cape and white tank top with skinny blue jeans, black jeans, coated jeans, leather pants and the list goes on and on. It doesn't matter where I'm going or who I'm out with, these items are always perfect. 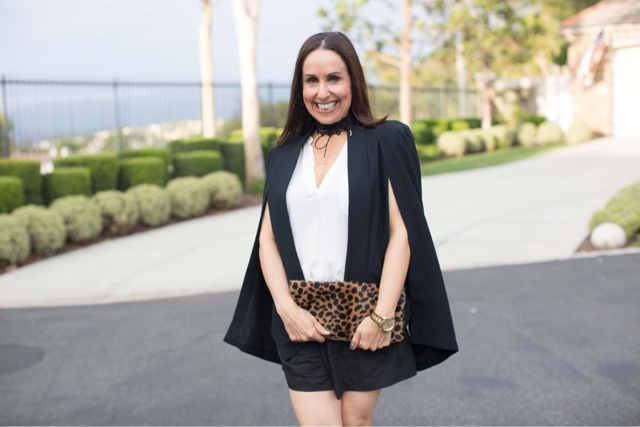 For this look I paired the cape and tank with these amazing Forever 21 black shorts, these adorable Chinese Laundry cute shoes (I picked up at Holly Sharp Boutique), this perfect choker from Luna B, and my new fave Clare V leopard clutch. This is the perfect look for a girl's night out or dinner with my hubby What are your go to pieces and how do you switch them up? I would love to know. Thanks to Taylor Cole for photos and Happy Reading!! You can shop the look by clicking on the links above!! !